really, i do, i dream in color. doesn't everybody?? 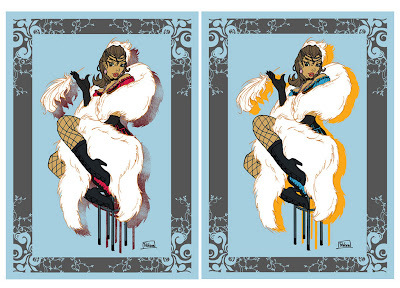 i've created two versions of each to see which one the client prefers. initially i was asked by the client to keep things mostly about the lineart and not about the digital colors. she felt that the lineart should be strong enough that it wouldn't need color except for a splash of colors to keep the focus on the lines. plus she didn't want it to look too cartoony. hence, the greek lady on the cloud is quite flat. but when i showed her the flats of these images, she had a tough time picturing it without all the colors and frankly, i have too. i'm trying to keep the main colors of reds, yellows, and a small bit of green or blue but doing that makes Clarity (the bellydancer) look like a zombie or a statue come to life. hence the need for choices. hopefully she'll like at least one of them. with Instinct, i tried to go for an art nouveau (which, by the way, is a really hard word to spell) with the border patterns. she's french and all. the colors choices i made were more of an experiment. i don't know which i like better, the red drop shadow or the yellow. i like how both colors pop against the blue. did i mention i am a bit indecisive?? 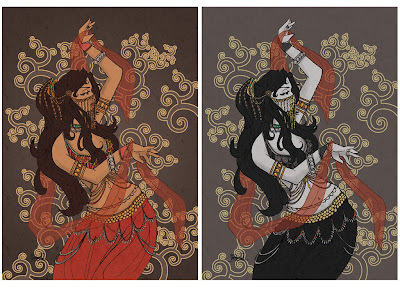 ooh, i really like the bellydancer version on the left. did you draw the entire bg too?